Dorian Hanaor, Matthias Kolb, Yixiang Gan, Marc Kamlah, Regina Knitter (2014). 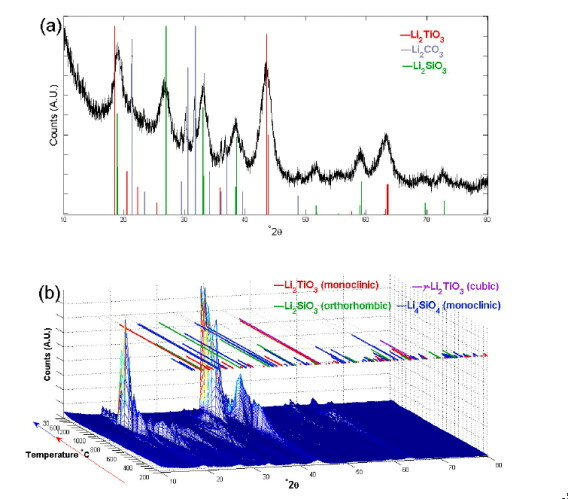 Solution based synthesis of mixed-phase materials in the Li2TiO3 -Li4SiO4 system. Journal of Nuclear Materials (in press). Figure: XRD pattern for hydroxide-route-synthesised material of L3TS composition subsequent to drying at 180°C. (b) Temperature varied XRD for hydroxide route synthesised L3TS material. From front towards back shows increasing temperature, up to 1200°C, followed by cooling. Reference patterns are superimposed on horizontal plane. This entry was posted in Publications and tagged materials, nuclear fusion, publications, research. Bookmark the permalink. Post a comment or leave a trackback: Trackback URL.